“You have a cavity.” These are the words all patients dread hearing at routine dental check-ups. However, the reality is that most patients have, or will, hear these words at one point or another. But even though most patients have experienced a dental cavity at some point, most don’t understand how they form. At Dr. Byron Wall’s Albuquerque cosmetic dentistry practice, Dr. Wall believes that understanding how a cavity forms can give patients a better understanding of how to prevent dental cavities from developing. While it may seem that dental cavities sneak up on patients overnight, the truth is that a dental cavity is the result of slow, but progressive tooth decay. The first stage of any dental cavity is the exposure to plaque left behind by food and beverages, especially those that are high in sugars, starches, or acid. Obviously, it is the function of the teeth to chew food, so it is impossible to avoid contact with these substances. However, by limiting exposure to certain foods (particularly those that are high in sugar) and by cleaning the teeth thoroughly after food and beverage consumption, patients can prevent the cavities from developing. Plaque accumulates on the teeth. At first plaque is soft and can be removed by brushing. However, if the plaque remains, it begins to harden, like cement. Bacteria reside in and are protected by the layer of plaque. These bacteria release acids that slowly eat away at tooth enamel. As tooth enamel is destroyed, bacteria enter the inner layer of the teeth and eat away at the inner structures of the tooth. When a cavity occurs, Dr. Wall provides patients in Albuquerque with high quality cavities treatment.While a dental cavity is not ideal, it can actually get much worse. 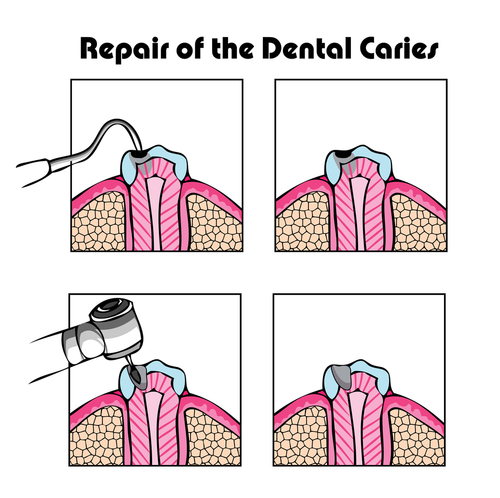 If the cavity forms and remains untreated, the decay will continue to progress. While a dental filling can be applied to repair a typical dental cavity, for patients in Albuquerque, dental crowns are required for more extensive tooth decay. Because dental cavities a sign of tooth decay and damage, it is extremely important to maintain a regular schedule of dental exams with Dr. Wall. Left untreated, tooth decay will continue to progress and may lead to tooth loss. Some patients may be naturally more vulnerable to tooth decay. Depending on the condition of the teeth and the patient’s overall oral health, Dr. Wall may recommend more frequent dental exams and cleanings in order to prevent the formation of dental cavities. While good oral hygiene habits are key in preventing dental cavities, it is just one part of the equation. Developing a routine dental schedule is vital to the health of a patient’s teeth. For patients who are looking for high quality, personalized dental care in Albuquerque, Dr. Byron W. Wall is the perfect choice. Schedule an appointment with Dr. Wall.